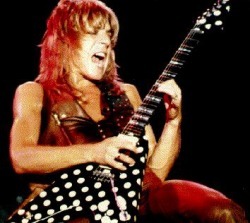 Randy Rhoads is best known for his heay metal guitar skills. The height of his career was with Ozzy Ozbourne. He is, and always will be, Ozzy's greatest guitarist. But before he entered stardome with Ozzy, he played for Quiet Riot. He was not very well known in the U.S. during his Quiet Riot career. They took the band over seas, to Japan, after not being able to secure a record deal in L.A. California. With Ozzy, he put out two hit albums: "Blizzard of Ozz" and "Diary of a Madman". His most well known songs are "Mr. Crowley" and "Crazy Train". His life was shortlived, as he died at age 25. Andrew Aycock took Randy on a joyride, in a stolen airplane. They attempted to scare the band members that were sleeping in the tour bus. They had succeded two times, but the third attempt lead to a crash and the death of the greatest guitar player the world has ever known. 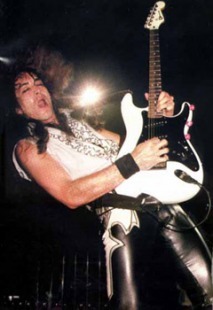 Jake E. Lee started his musical career playing classical pian, as a child. He would also play around with his sister's guitar. In 1982, when Lee was 25 he joined up with Ozzy Ozbourne. With Ozzy, Lee put out two hit albums: "Bark at the Moon" and "The Ultimate Sin". A live performance in Kansas City was filmed, and in 1990, was release with the title; "The Ultimate Ozzy". When the band was working on "Randy Rhoads Tribute", in 1987, Lee left the band. After his career with Ozzy, Lee started a blues band called Badlands. He put out four hit albums with Badlands: "Badlands", "Voodoo Highway", "Dusk", and "A Fine Pink Mist". His most recent album was put out in 2005, entitled, "Retraced". He is fifty-one years old, and still rocking hard. 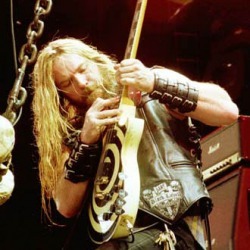 Zakk Wylde, is a well known guitarist. He is Ozzy Osbourne's current guitarist, and he is the founder of The Black Label Society. He is currently managing to play with both, his band, and Ozzy. His signature guitar is a Gibson Les Paul with a "Bullseye" finish. Zakk is a very successful guitarist putting out a number of great albums with Black Label and Ozzy. Career with Ozzy: No Rest for the Wicked, Just Say Ozzy, No More Tears, Ozzmosis, Down To Earth, Live at Budokan, Black Rain. Career with Black Label: Sonic Brew, Stronger than Death, Alcohol Fueled Brewtality Live +5, 1919 Eternal, The Blessed Hellride, Boozed Broozed and Broken Boned, Hangover Music vol. VI, Mafia, Kings of Damnation, Shot To Hell, and The European Invasion.